Two Amazing New Trips — Truly Once In A Lifetime because the Won’t Repeat anytime Soon! First, next year is the 500th Anniversary of the Birth of St. Teresa of Avila. We will spend 2 nights at Fatima in Portugal, then drive into Spain to relive the life of St. Teresa. Then we drive up into France to visit the amazing shine and baths at Lourdes. 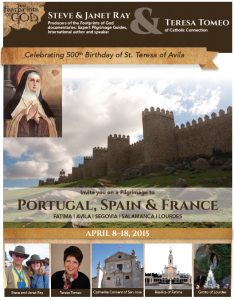 Join Steve and Janet Ray along with Teresa Tomeo for this amazing spiritual adventure in Portugal, Spain and France to visit Fatima, Avila and Lourdes. Second, the Pope made a surprise announcement that the Shroud of Turin would come out for veneration in 2015. 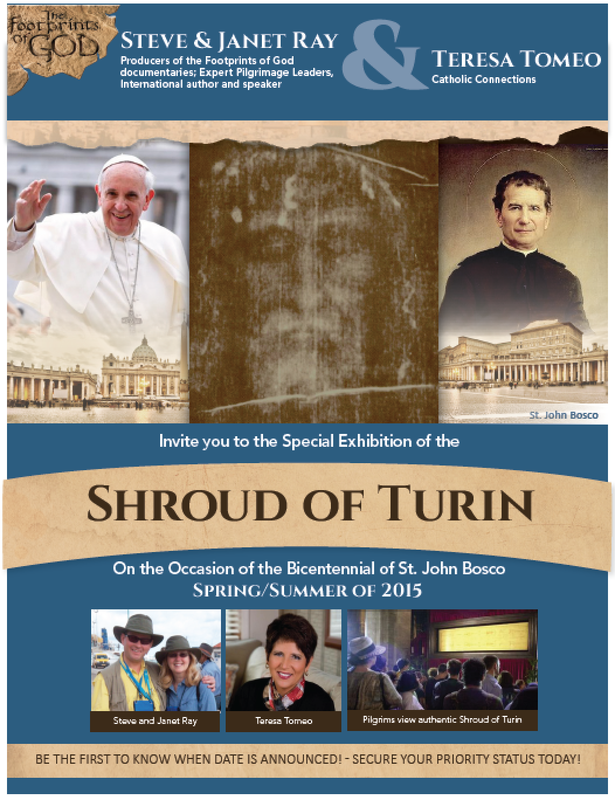 We jumped on the opportunity and will take a group in June to see the Holy Shroud of Jesus. 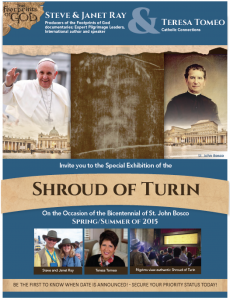 We start in Milan Italy, then 2 nights in Turin, 2 nights in San Giovanni Rotundo to see Padre Pio, the Cave of St. Michael, Holy House of Lortetto, Eucharistic Miracle of Lanciano, the Facecloth of Jesus in Manoppello, and more. Then 2 nights in Assisi and 2 nights in Rome with a Rome extension. For more information contact Suzanne at Corporate Travel at sparran@ctscentral.net or at 800-727-1999, extension 121.